As we arrived in Auckland during the Spring, we realized that it was a bit colder than we were hoping. Therefore, to the Northland, we would go in hopes of warmer weather and a bit of the countryside! We spent about 9 days traveling around the Northland, and let me tell you, it is gorgeous! 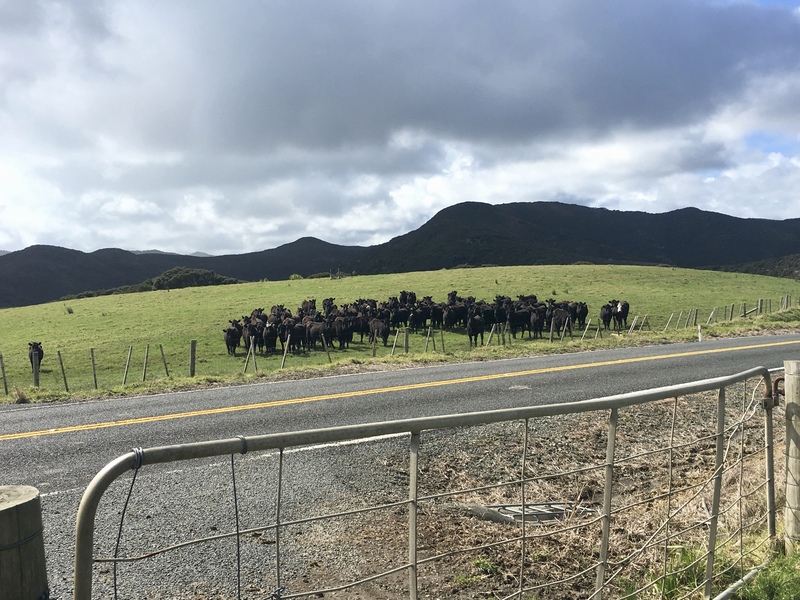 Without further ado, here are my top 5 favorite New Zealand’s North Island attractions to do in the Northland, in order, 1 being my favorite! The first 3 all are things that are in or around Cape Reinga, which just happened to be my favorite place of the Northlands. To be fair, we had the best weather in Cape Reinga, especially considering the spring is typically extremely rainy. 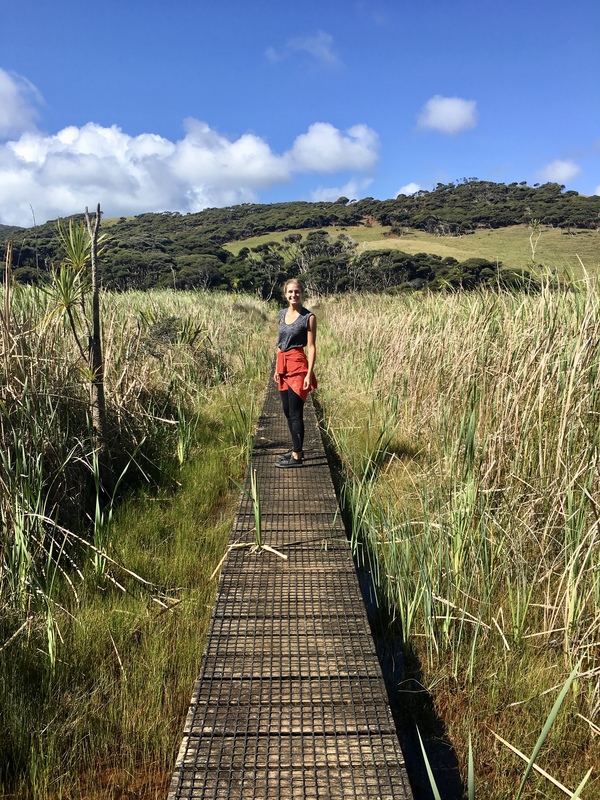 Audrey and I decided to be a bit ambitious and go on a 16 km tramp (tramp = hike for those of you not down with the lingo…). This tramp was interesting/ridiculous for many reasons. First off, in America, I feel like hikes are very well-marked or easy to follow. If there is a small chance that a human could be confused and get lost, there is usually a bajillion trail markers. New Zealand… Not so much. Some parts of the trail are somewhat clearly marked others… Ehhh good luck to ya. With that being said, here is my summary of this walk. We start out in a legit farmers field, walk about 200 meters, and there is a large herd of cattle staring at us. Now, I don’t boast much knowledge of bovine. When we walked by, there were legit 50 cows, gathering together and staring at us. We weren’t sure if this was due to the expectation of food when humans are around, or if they were crowding together to cow-laugh at us… Could have gone either way. This was due to us already got being lost, a solid 3 minutes into the walk. I blame NZ trail markers. They are few and far in between. It wasn’t until a sold 5 minutes if looking around did we see the orange flag, perhaps a half kilometer away. Moving forward… The amazing part about this hike is that we seemed to manage to see every type of terrain. We started in farmland, then moved to a forest/jungle, then the desert, after the savanna, and beach! Very strange. The desert portion was probably the most difficult to navigate, as you would have to search over long distances to see the next trail marker. Nonetheless, the hike was amazingly beautiful, and I loved it. Though we got caught in the rain, and almost got lost… It was stunning and an amazing day! 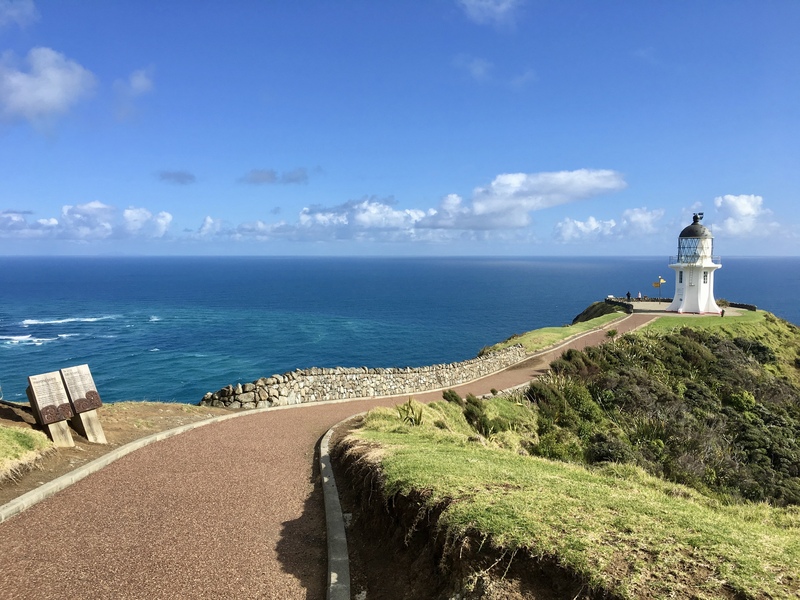 Cape Reinga is essentially the most northern tip of New Zealand that you can travel to! It is also where the Pacific Ocean meets the Tasman Sea! This creates the whitewater whirlpools effect on the left side of the photo shown here. Another fun fact about Cape Reinga (meaning the Underworld), is that in the Maori culture when a person dies, their spirit comes to the Cape and departs for their eternal home. In addition to its cultural significance, it is a place of incredible beauty! 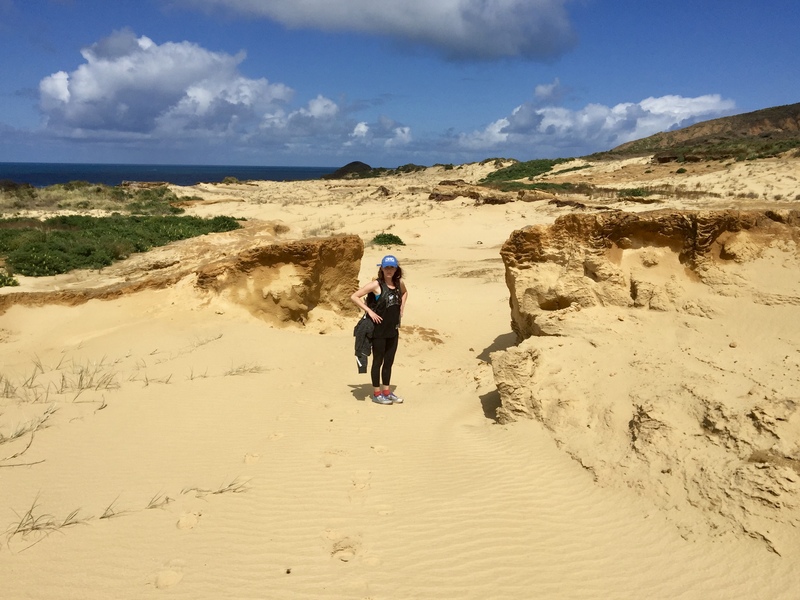 As mentioned in my Traveling Problems… post, the process of figuring out how to find the sand boarding place was rather a struggle… However, once there, it was a lot of fun… Terrifying… But fun! 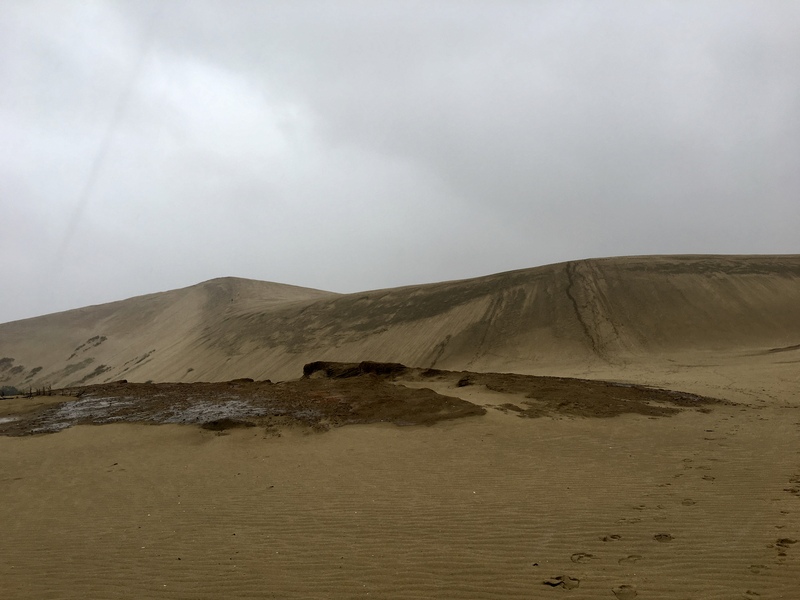 What to say about sandboarding… think sledding, but on the sand… Also, the rain tends to make you go faster, so that was exciting! It cost $15 to rent the board for an hour or so from Ahikaa Adventures. Though, the lady did not seem to care that much as it was rainy and therefore, not that busy. Especially, as we lent her our lighter to be able to light her camping grill. She did return the favor and gave us some oranges! The actual ascending to the top of the giant dunes took so much effort that we did not go more than 5 times. I am so out of shape. Another important location to the Maori people (the native New Zealand people) is the Waitangi Treaty Grounds. The Waitangi Treaty Grounds are located at Paihia in Bay of Islands. 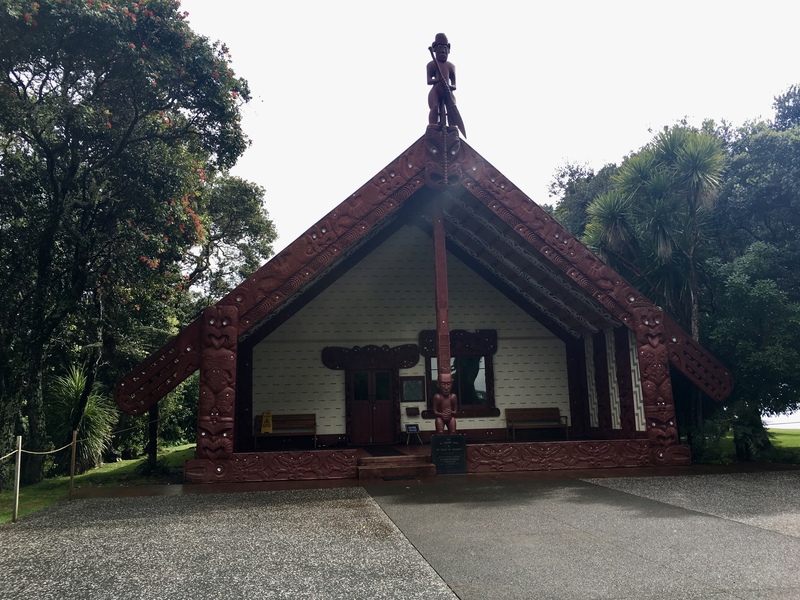 This location included the negotiation and initial signing of a peace treaty between the Maori people and the British as well as other significant events. We were treated to seeing some incredible war canoes and traditional Maori greetings and dances. Fun fact/story: When Abel Tasman first arrived at New Zealand, he never actually set foot on New Zealand land. His ship remained in the harbor. He was greeted with traditional Maori horns and dances. 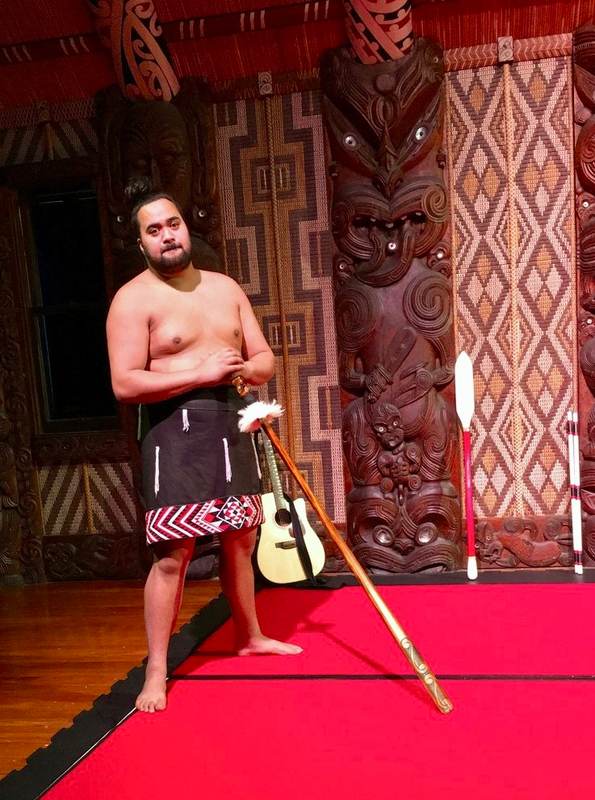 Not knowledgeable of the Maori culture, he responded with a horn of his own. Instead of a greeting, this actually signified war with the Maori people, and thus, they boarded and attacked Abel Tasman’s ship. After this occurred, Abel Tasman left New Zealand and never returned. One more fun fact, Abel Tasman named New Zealand. As the country reminded him of a Dutch providence called Zealand. Therefore, when he saw this beautiful new country similar in nature, he names it New Zealand. Overall, it was a lovely learning experience. I believe it is very important to not just experience the activities a country has to offer but to learn about its history as well! Both the good things and the bad! The last thing on my list is the Waipoua Forest, which is home to the giant Kauri trees! Think the Redwoods forest, but the New Zealand version! These massive giants are thousands of years old. 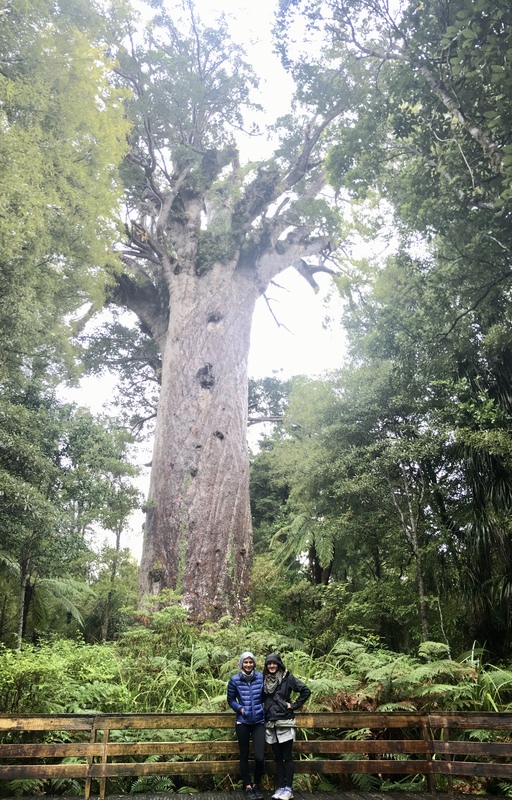 One specific to mention is Tane Mahuta, or Lord of the Forest, who is over 2000, is the largest living Kauri tree in New Zealand. His dimensions are the height of 51.5 meters, trunk girth of 13.8 meters. These gentle giants are incredible to see and are worth the side trip to the Waipoua Forest. Also while in the Waipoua Forest, we saw the Four Sisters (a group of 4 Kauri trees growing together) and the 7th largest Kauri tree. It was a lovely jaunt through the Kauri forest! The Northland has much to offer, but Audrey and I moved through it rather quickly due to various circumstances. For instance, I wasn’t feeling great in the Bay of Islands, which was disappointing as there are some lovely things to do there, including the Hole in the Rock, kayaking, and dolphin watching to name a few. Waipu Caves: There is a short 1.5-hour hike, but it literally leads to nowhere. Kind of funny though. The caves were incredible and had glow worms. 90-mile beach: I would have probably liked it more if it wasn’t raining the whole time I was there, and we weren’t able to drive on it. Uretiti Campsite: $13 per person, and beautiful beaches to wake up to! Enough of my tales for now. Until future endeavors and adventures!